coffee grog in the making...Rick is Da Man! I hope some of you get a chance to visit the Mai Kai restaurant in Ft. Lauderdale. It is one of the last remaining Polynesian Mecca’s in existence. It really celebrates American Poly pop in all its glory years. When you visit, you must order the Coffee Grog as dessert. 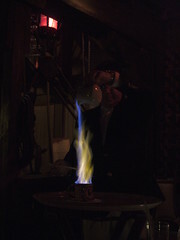 The server prepares the drink before your eyes in spectacular fashion. The drink is so wonderful...creamy, buttery, and served with a cinnamon stick.